An escape to a world of inspiration! 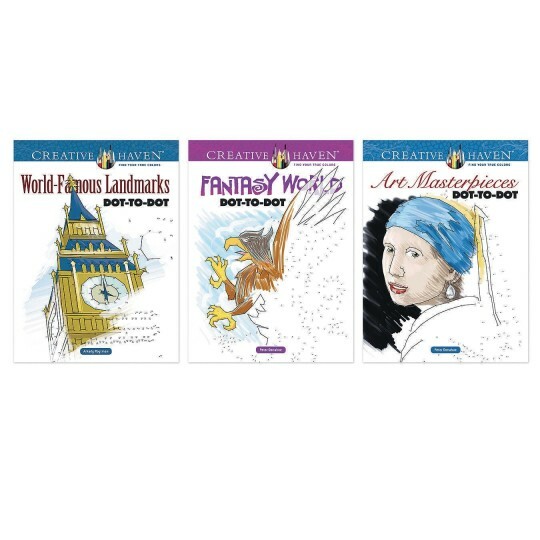 Each incredible book in this set of 3 features 30 complex puzzles sure to prove that dot-to-dot challenges aren’t just for kids! Each page features hundreds of dots that reveal surprising pictures. And you can double the fun by adding color to the finished images! Pages are perforated and printed on one side only for easy removal and display. 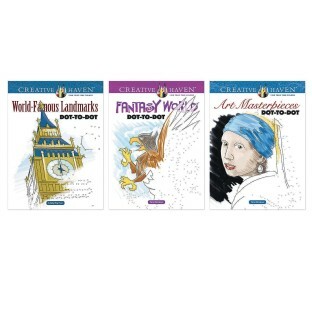 Specially designed for experienced colorists, Creative Haven® adult Dot-to-Dot and coloring books offer an escape to a world of inspiration and artistic fulfillment. Each title is also an effective and fun-filled way to relax and reduce stress.